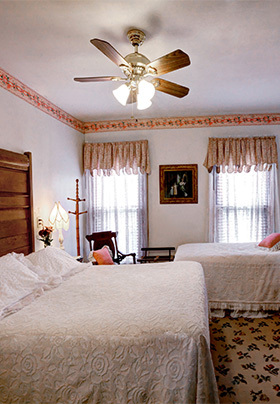 The Peppenelli Suite (#4) is a charming Victorian lodging option located at the rear of the second floor overlooking Franklin Street and downtown Cape May. The suite sleeps up to five guests. The Peppenelli Suite is highlighted by the antique oak Eastlake queen-size bed, hand-rubbed from dark oak to its natural oak beauty. It once belonged to a young man who lost his life as a Pilot in World War I and was hidden in a mansion for 75 years. The Peppenelli Suite is tastefully appointed with a mix of antique and contemporary furniture, handmade curtains, drapes, and Victorian lampshades. 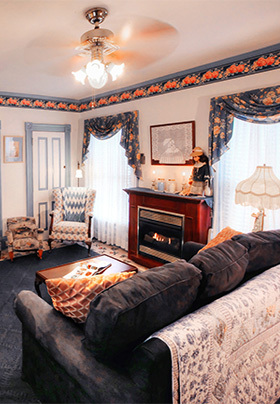 A combination living room and dining area with one queen-size sofa bed, flat-screen TV, VCR and DVD, antique teak dining room set, cherry gas-log fireplace with remote control, and handmade Victorian lampshades. Fully equipped, open kitchen with gas stove, microwave, toaster oven, coffee pot, and refrigerator. Master bedroom with an antique oak Eastlake queen size bed, extra long twin size bed and flat-screen TV/DVD/VHS. Hallway leading from living/dining room to bathroom, with private entrance to bedroom. Private bath with modern shower, toilet, and sink. Two single-room air conditioners in both bedroom and living room. Ceiling fans in bedroom and living/dining room. Private entrance to suite from rear of house, or from top of second-floor stairs. Free street parking on Washington Street across from Antoinette’s Apartments & Suites.